Indie band The Editors are promoting their new album 'In This Light And On This Evening' through a London Google Street View mashup hosted through the Editors website at www.editorsofficial.com/streetview. 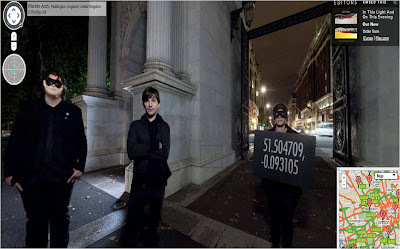 Google have previously worked with Radiohead on a data video for 'House Of Cards' and used Google Earth to help the Chemical Brothers promote 'Midnight Madness', however the Editors are the first artists that I have seen using Google Street View to promote their work. The Editors website says: "Make your way through areas of London on Editors’ Google Maps and you’ll come across certain areas where the band have hacked in their own custom locations. The new additions consist of some rather nice 360 degree images, shot at night, and starting in Primrose Hill. Within each location the user will hear music from the album, which was inspired by the mood and magic of London at night. Each of the nine tracks on the album has it’s own location. The images feature the band and a group of their fans performing surreal activities which reportedly have hidden meanings relating to the songs - see if you can work out what they are?" 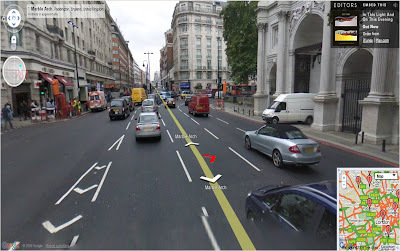 The Editors' Google Street View is a customised version of the program with users seeing a red arrow that has been added to the Google Street View image at various locations. Clicking on the red arrow takes Editors Street View users to night time images featuring the band and a stream of the relevant single. A clickable map in the bottom right corner of the screen shows all 9 of the Editors Google Street View customised locations. Interesting project and shows that Google Street View is gaining wider acceptance? Google Street View UK launches - what can we find?